A surge in the number of energy efficiency projects commissioned has been reported in the latest UK Energy Efficiency Trends report published by EEVS energy analysts and Bloomberg New Energy Finance today. Over 80% of those responding to the survey confirmed they had authorised new programmes in Q3 of 2015. This is the highest proportion of new projects recorded in a single quarter since the survey began in 2012. It also shows a significant uptick in commissioning, exceeding the long term trend of 70%. 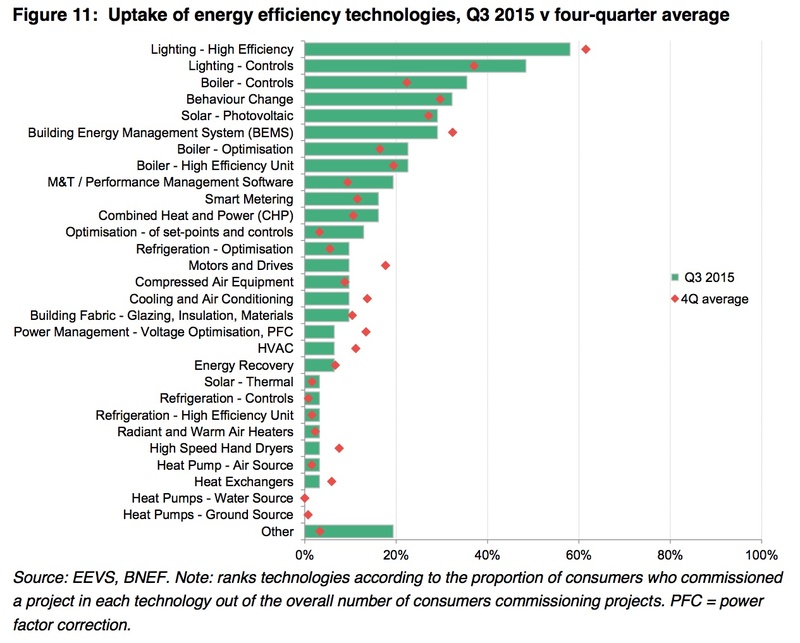 Of the technologies being used, lighting continues to outperform other energy saving technologies (Figure 11, below). The specification and use of lighting controls grew, with a noticeable increase during Q3. Boiler controls also experienced growth, perhaps due to seasonal influences, as did projects that included efficiency measures to a building’s fabric. There was a fall in the number of measures specified for heating, ventilating and air conditioning systems. Survey responses showed that the capital cost profile of energy efficiency projects remained volatile. Q3 saw a strong volume of smaller scale projects (up to £50k) and large projects (over £500k), but the core mid-range (£50 – 500k) was down, accounting for only one in five projects. Financing arrangements remained stable, but a trend that has emerged throughout 2015 has been the use of combination funding (a mix of in-house and external finance). Financial payback periods returned to the long term trend of between three and four years, driven by a growth in longer five to 10-year payback projects. Energy efficiency suppliers reporting rising national orders dropped to an all-time low in Q3, whilst overseas orders picked up for 28% of respondents. Supplier demand however remained the biggest single sectoral concern at 31%. When combined, however, 35% of suppliers were concerned about government impacts on performance, with regulation (14%) and subsidy/policy uncertainty (21%). Commenting on the findings, Ian Jeffries, Head of Performance Management at EEVS, said “This set of quarterly market results points to something of a ‘a tale of two sectors’.